Last week I was extremely disappointed about missing out on a long-awaited ride on my bike. Saturday, I was finally, thankfully, able to get out and ride for a while. The sun warmed up everything nicely, and it was about 70 degrees when I set out. I got a semi-late start, owing to the fact that I had to double-check my bike again (it was the first time I’d climbed aboard in six months), and the fact that I wanted to be sure I’d be okay diabetes-wise. So I stuffed a salty/sweet nut bar in my bag, and I made sure I had a full bottle of water with just a bit of Gatorade. The BG check prior to the ride showed 185 mg/dL. When doing something like this, a number like 185 is not a concern at all. In fact, it’s a good sign. I had no insulin on board. I set a temporary basal on my pump of 15 percent. That’s right, just 15 percent. Actually getting to ride for an hour was huge for me, as it always is the first time I’m out. That’s because of many things. It feels good, of course. I’ve always been the kind of guy that enjoys the feeling of freedom you get from riding a two-wheeler (I felt the same when I rode a motorcycle). And the difference in training on the road versus being in the gym is pretty big too. You’re stressing your muscles in ways, particularly uphill, that can’t be replicated on a spin bike, even in a tough class. I climbed three short but difficult hills, with three corresponding steep downhills (which have scared me ever since a bad bike crash three years ago). I moved deftly around traffic when necessary, and managed to avoid some nasty potholes that exist now thanks to our recent difficult winter. I think I covered 14 or 15 miles, and wound up with a finishing BG of 89 mg/dL. Having a nearly 100 point drop in an hour tells me, if I’ve been reading correctly, that I was exercising in the aerobic range for most or all of that hour. If my number was higher, it would be a good indication that I would have been in the anaerobic range for a while. Or that I was dehydrated. Or both. Regardless of where I was and how hard I was exercising, I can’t tell you how thrilled I am that I got this in. My 62 mile/100 km ride happens in four weeks. I need to be on my bike as often as possible, and at the gym when it’s not possible, over the next three weeks. The good news is I’m making progress. The bad news is I’ve got a long way to go. In short, I was the first person at the check-in table for the 65-mile ride at the Tour de Talbot, which benefits both the Midshore Riverkeeper Conservancy and JDRF. Yeah, yeah, ha, ha, that was funny the first twenty times. Those kind of comments were understandable, but not fun. However, an interesting set of circumstances had me changing my mind. 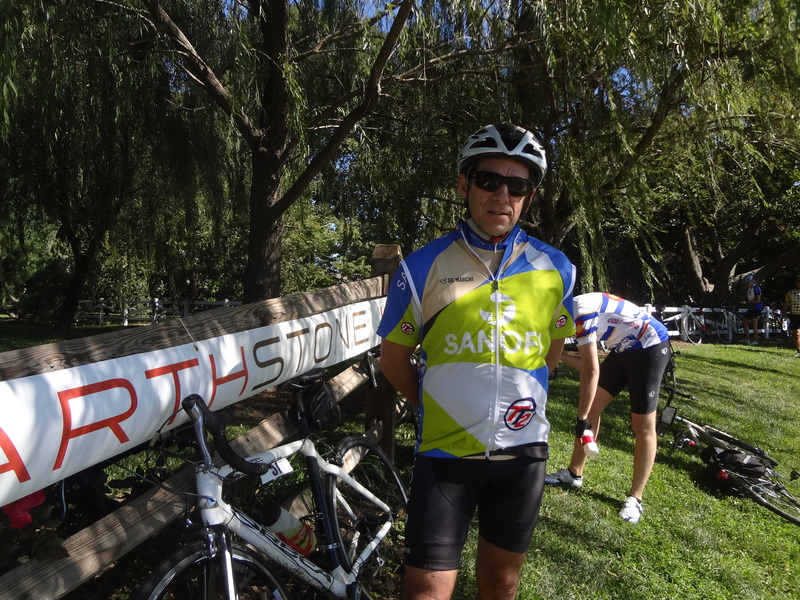 At the first rest stop on my ride, I briefly saw John Anderson from Sanofi Team Type 1 (He’s actually part of Team Type 2). He lives in Annapolis, about an hour’s drive from the start. He did the 100 mile ride Saturday. While taking a photo of the volunteer table at the stop, I caught John as he was getting back on his bike. I didn’t want to bother him as he was getting ready to take off, so I just went about my business and didn’t think about it again. I figured that was the only time I would see him all day. 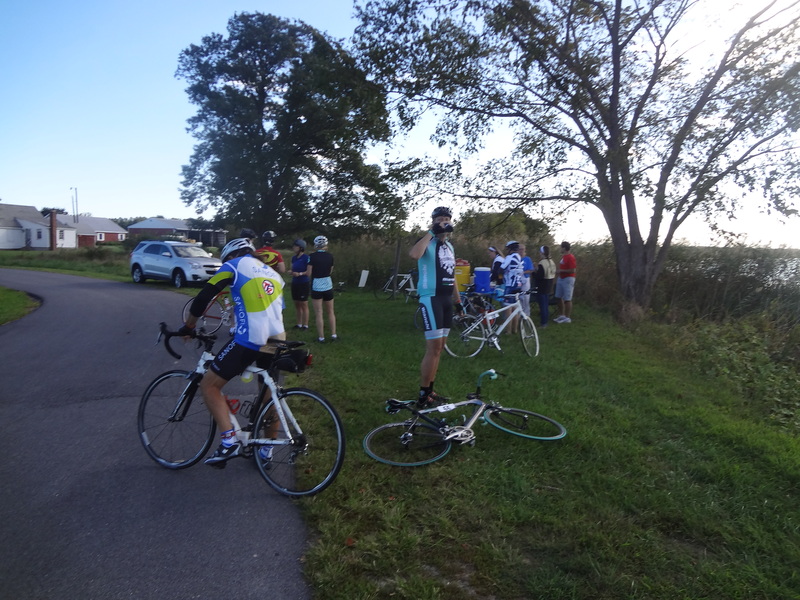 Then at the next rest stop, I had a quick break, ate a granola bar, and got ready to go again. But I realized that I hadn’t checked my BG yet, so I pulled my meter out of my bag to check. I did a quick turn to my right as I checked, and who was there? John Anderson. Then I thanked him, shook his hand, and went to put my meter away and get on the bike to finish the last third of the ride. When I started off, I noticed someone else was getting started again to my right, and when I looked over, it was John. We rode together for about a mile, talking about exercise… I mentioned my blog… and he told me a story about being in a run in Baltimore a few years back. And because he’s usually at or near the front of the alphabet in these events, he received number 1 for the run. “It made me feel good; I thought it was kinda cool. Everybody notices you when you’re wearing number 1”. That lifted my spirits for the rest of the ride. So what was the ride like? 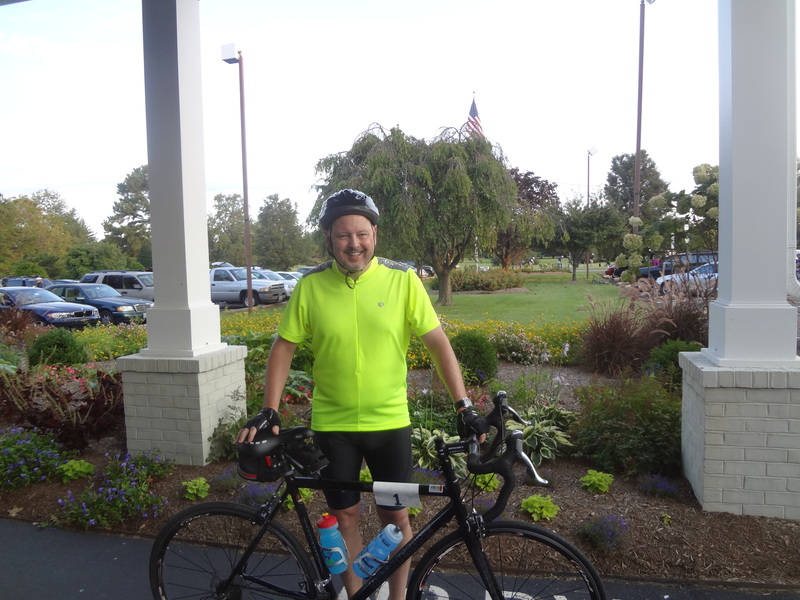 Well, it was a measure of redemption after the 100 mile ride I was a part of in June. I got advice from other riders and from my doctors in the interim, and my nutrition and overall preparation was a lot better than it was for the last ride. I did not finish number one on this ride, but that wasn’t the point. In fact, this was the most laid-back event I’ve been a part of in some time. There was no official start/finish line. There was someone who gave a brief announcement at the start, but that person didn’t even say “Okay, Go”, or blow a horn, or anything. He stopped talking, all of the riders looked at each other, and then we just started. When we all finished, we just stopped, next to where we parked our cars in the lot of the country club where the ride originated. That was it. But it was a nice ride, through some beautiful country near Easton, Maryland. There was a cold front that came in a couple of hours before the ride started, and that resulted in some strong headwinds through most of the first 40 miles or so. After that, it was great. Temperature at the start: 60 degrees, with 10-20 mile per hour winds. At the end, it was around 70 and the wind had died down a lot. This time, especially at the end, I stopped trying so hard and started enjoying the ride and the view from the saddle. Time to finish: About four hours, not counting the time at the two rest stops. 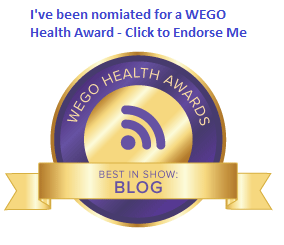 And best of all: I felt great after! Priceless.